This week's Weekly FIVE is dedicated to the 2019 European Championships, which begin April 8-14 in Bucharest, Romania. There will be 22 returning European champions competing at next week's 2019 European Championships in Bucharest, Romania. Greco-Roman and women’s wrestling each return eight of the ten Kaspisk gold medalists. In Greco-Roman, Adam KURAK (RUS) and Artur ALEKSANYAN (ARM) are two defending champions who’ll sit out in Bucharest, while the pair of women’s wrestling returning champions who won’t make the trip to Romania are reigning 50kg and 68kg gold medalists respectively, Mariya STADNIK (AZE) and Anastasia BRATCHIKOVA (RUS). The Freestyle competition is expected to feature six returning champions. The tournament will be without Russia’s Gadshimurad RASHIDOV, Artur NAIFONOV, Abdulrashid SADULAEV, and Turkey’s Soener DEMIRTAS. Just when the wrestling world thought the Russia Federation’s Greco-Roman lineup couldn’t get any better, they fill in their “holes” with the likes of Olympic champions Roman VLASOV and Davit CHAKVETADZE and four-time age-group world champion Aleksander KOMAROV. Vlasov, the two-time Olympic champion, pulled out of the World Championships two weeks prior after undergoing knee surgery. He gets reinserted into Russia’s lineup over his backup Aleksander CHERHIRKIN, who took advantage of Vlasov's absence by winning the 77kg world title in Budapest. Olympic champion Chakvetadze takes the place of Bekkhan OZDOEV (RUS) at 87kg, and Komarov, takes over for Imil SHARAFETDINOV (RUS) at 82kg. With the additions of Vlasov, Chakvetadze, and Komarov, Russia’s lineup now features five returning world champions, two Olympic champions, a four-time age-group world champion, and a U23 world runner-up. The only wrestler without a world medal is Abuiazid MANTSIGOV, who fell in the 2018 bronze-medal bout at the 2018 World Championships. Turkey elected to insert Yakup GOR into the European Championships at 74kg over three-time defending European champion Soener DEMIRTAS. Gor, the two-time world bronze medalist, moved up to 74kg after finishing the 2017 Paris World Championships with a 70kg bronze medal but lost his starting spot to Demirtas in 2018. Gor comes into the European Championships ranked No. 6 in the world at 74. He has 28 Ranking Series points after his falling to defending world champion Zaurbek SIDAKOV (RUS) in the Ivan Yariguin finals, and a bronze-medal finish at the Dan Kolov. Poland made the difficult decision to roll with reigning 55kg European runner-up Roksana ZASINA (POL) over the world’s sixth-ranked 53kg wrestler, Katarzyna KRAWCZYK (POL). Zasina, the No. 16 ranked wrestler in the world and 2017 world bronze medalist, is dropping down from 55kg and takes the 53kg European spot from Krawczyk, who was a fifth-place finisher in Budapest and bronze medalist at the 2018 European Championships. 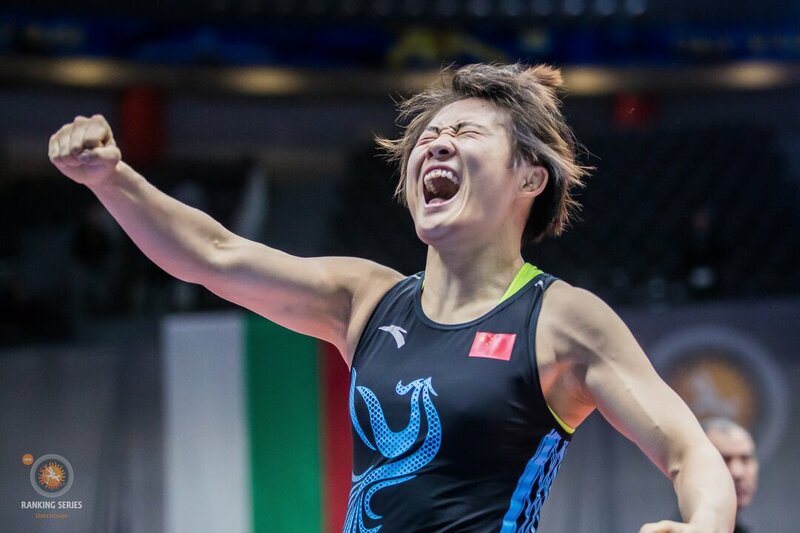 The European Championships will be Zasina’s first appearance down at 53kg since her world podium run in Paris in 2017, where she finished with a bronze medal. Defending 82kg European champion Maksim MANUKYAN (ARM) will move up to 87kg for the European Championships. Manukyan, the 2017 80kg world champion, has bounced around over the past twelve months from 82kg to 87kg but has never competed above 82kg at a Continental or World Championships. Last season, Manukyan competed at 82kg in both Kasipiisk and Budapest. For Manukyan to win his second consecutive European title, he’ll have to upend reigning 87kg European champion, Roberti KOBLIASHVILI (GEO). 1. #WrestleBucharest European C'ships, One Week To Go! 2. #OnThisDayHaji ALIYEV (AZE), the reigning 61kg world champion gave Azerbaijan their second straight gold medal of the night with a last-second takedown to defeat reigning 65kg European champion, Ilias BEKBULATOV (RUS), 8-7. #WrestleBucharest , 6 Days To Go ! 3. Reigning 77kg European champion, @vlasovroma90. Does he repeat next week at the #WrestleBucharestEuropean Championships? Reigning 77kg European champion, @vlasovroma90. Does he repeat next week at the #WrestleBucharest European Championships?